James started his "Hey, Bill" series ten years ago, in August 2017. The very first question he ever answered, I think, was along the lines of "Sabermetrics does not evaluate players. Sabermetrics seeks to understand the game of baseball." Could I add something to that? Sorry. . ..I thought of something I wanted to add to the previous question, but the system doesn't allow me to edit an answer once I have posted it. 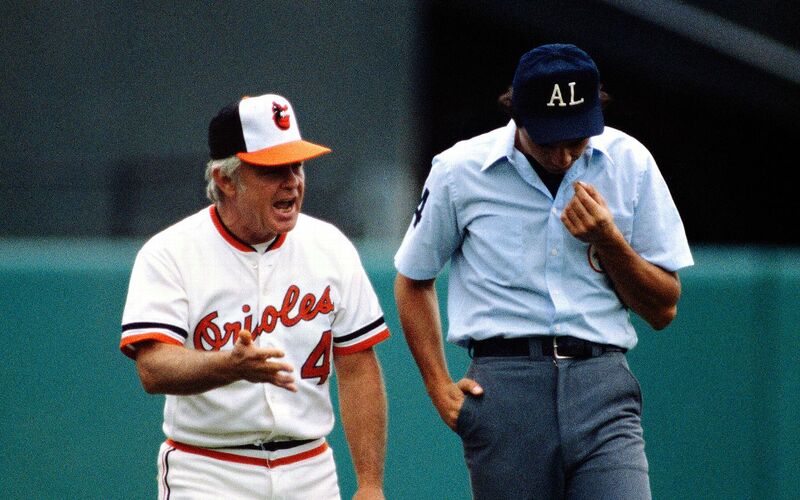 We'll fix that, but anyway, Pete DeCoursey had asked about matchups in post-season play, referencing Earl Weaver. If batter/pitcher matchup data is meaningless, Pete asked, why was Weaver so successful? I always thought that perhaps Weaver's system worked, but not necessarily for the reason people thought it worked. Weaver collected outfielders, first basemen and DH types, occasionally catchers and third basemen, with severe limitations but identifiable strengths. . .left-handed .320 hitters who couldn't run, right-handed power hitters who couldn't throw, short switch-hitters who walked every day but struck out twice. He rotated these players based on matchups, true, but he might have been equally successful if he had rotated them in and out of the lineup by pitcher height, hair color and biorhythms. And, by the way, that system would work better now than it did then. The enormous expansion of the bullpens since the 1970s has trapped in the minor leagues dozens of the types of players that Weaver worked with, the two-dimensional outfielders. It's a lot easier to find those guys now than it was in Earl Weaver's day. In other words, James doesn't believe that Weaver's "specialty screwdriver" oddball bench players were effective because (1) he matched them well to certain situations, but rather because (2) such players were underrated generally. In other words, if a player is -5 runs throwing because of an ugly outfield arm that turns people off, but +15 runs due to something else, people will cancel that as =0. James believes that this "moneyball" opportunity is even more prevelant today - that there are many more such players around the fringes of baseball's rosters, if you'll look for them. I got to thinking about that, how Dee Gordon is such an extreme anti-TTO player and such an extreme groundball hitter, and got to musing .... to what extent does Jerry Dipoto share Earl's fondness for an iguana ballplayer who looks uglier than he plays? Ben Gamel, Nick Vincent, short righty Erasmo Ramirez, bat-first dubious-glove Jean Segura, etc. I don't know if Dipoto is that way. Hope he is, though. If DiPoto has a Prime Directive in his GMing philosophy (at least in Seattle) it is that you don’t overpay, in cash, for anybody. If he has a #2, it likely is that you don’t get too married to any young asset. Segura came in a swap of youngish assets, with Haniger sort of being the key. From an Arizona perspective you could see that trade as one SS dealing with personal tragedy and a slump for another, younger SS + a second swap of an established young arm for a projectable young bat. Or you could look at it as on offense for defense switch. In that regard, DiPoto was Weaver-esque. in fact, grabbing Gamel was sort of like that, as was trading for a Vogelbach and grabbing Ford. Maybe Healy, too. So maybe the DiPoto Rule 3 is grab young bats who might explode. It seems he sees young arms for their risk of (injury) imploding, but young bats for the opposite. Grabbing Leake was out of necessity, so that doesn’t count against that trend, although trading Tank for Gonzo does seem to go against his personal tide. Gordon was sort of a bargain, in that he was always going to bring a 2B glovey value, even if it was a year delayed. He also brings a disruptive ability on the bases and .300-ability, albeit light hitting. The reach was being willing to grab him now, even though you had no natural spot for him, as it might not be available tomorrow, when you do have that spot for him. He was sort of seeing the offensive potential and poo-pooing the potential defensive risk. Grabbing Valencia was an up-side bat move, with short term risk. The Dyson trade goes against the “grab a bat” offensive current, however. I didn’t like it then, still don’t. I remain surprised that he didn’t pull off a Randall Grichuk trade, as his bat has that upside DiPoto seems to love. In 9 of the 10 years from ‘66-‘75, Earl had between 1-3 bench guys who combined for 400-800 PA’s with OPS+ of 120, or more. That sort of was a secret weapon, along with Jim Palmer or two. Of course, modern free agency sort of changes a manager’s ability to do that. I do and don't like JeDi. I like his confidence and he seems likable as a human being. The Walker trade was a good one. Tank was a overpay. Marco brings nothing. I would like to think they were banking on the extension on options. That outfield would look so much better to me with Dee in CF, All star caliber Mitch Haniger in RF and a combo of Gamel and Tank at least until Heredia is healthy. Tank has decent speed he has played 15 games in CF. I still just shake my head over that one. Gohara and more going for Smyly and less is a catastrophe. Gohara was our lone potential TOR in the minors after switchig Diaz to BP. There is a crowd that pushed for our #2 is only as good as their # 18 BS. That statement fell flat after new ranking slotted Tank as their #3 ranked shortly later. Question? What did Marco do to deserve such an overpay? Question: Are you happy with the Scrabble sign? To me that seems like an overpay. To me the most glaring need was the adding of a TOR the whole time. I saw the need to add a 1B and plaenty were available for cash. I was pleased to see the Healy trade as that free'd up $ to go after that TOR, and OF which CF was preferred. I wanted Cain but Dee looks like 75-80% of that for relatively shorter years and probable about the same WAR/$. I and about everyone else in Baseball agreed that Otani was the #1 target this year. We missed. I would rather not have payed 5.5 M for Scrabble(.3war), another 5 for Erasmo, another 2 to 8MM on re-up with Kuma. I don't consider Romine an upgrade over Motter or my fellow TC kid O'Malley. :-). Another wasted MM. Finally are we super confident our new poor man's Andrew Miller type Juan Nicasio(9MM). Note I kinda do like Erasmo as a #5, I am hopeful that Nicasio is a 2WAR BP guy, and Kuma has a throwback to CY contender but those would not be the moves I would make. I would rather keep the 9 for Juan, 1 for Romine, 5.5 for Scrabble, 2 to 8 for Kuma, and use those dollars to get Darvish. Darvish has CY potential, teamed with Paxton gives you the possible Dbacks Unit-Schilling twin ace fueled WS run. Cruz comes up after 18 and Felix's 27 M not ling after. a slight back load allows for you to present as same dollars on todays bedget. The same could have been said even if we got Otani. Again, I don't see JD getting "value". I think he overpays in many trades. He has pulled a few good ones but in Free agency you don't pay millions for .3 WAR and brag about spending less than other teams. Old addage is "You get what you pay for.". Believe you me I would rather pay for what we need and that is the WAR needed to close the big gap with the best in the league. I just think JD's design is great for competing against the teams of 10 to 15 years ago.